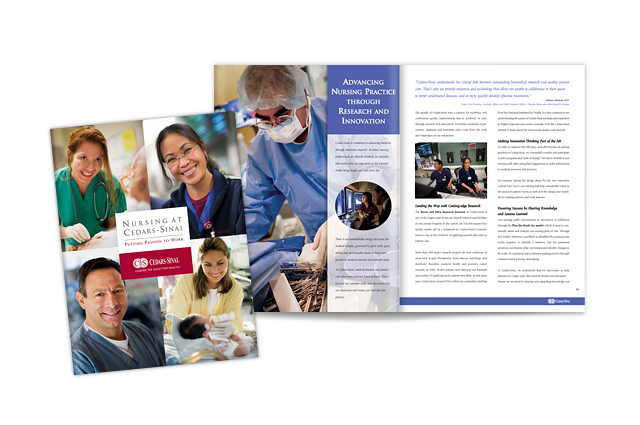 Objective: The nursing department at Cedars-Sinai is a pioneer in the development of unique practice disciplines for nursing in the United States. The Vice President of Nursing travels throughout the Untied States lecturing on the teaching and practice philosophy that goes on at Cedars-Sinai. She was in need of a support piece to detail its philosophy, aid in her presentations and to act as a leave behind. LITCO was hired to design and edit this important piece of collateral under the direction of the public relations and nursing departments.